The school's policy is child-centered which promotes a child's participation in all aspects of school life. It remains family focused and helps children, parents and teachers to form harmonious relationships. The school aims to promote the learner's communication, social, economic and functional abilities and development of these skills independently into everyday life situations. A natural environment is facilitated to encourage skill acquisition. The school emphasizes and builds on the existing strengths of children by following CBSE guidance. The School focuses on community participation and correlates between the practical and the theoretical. 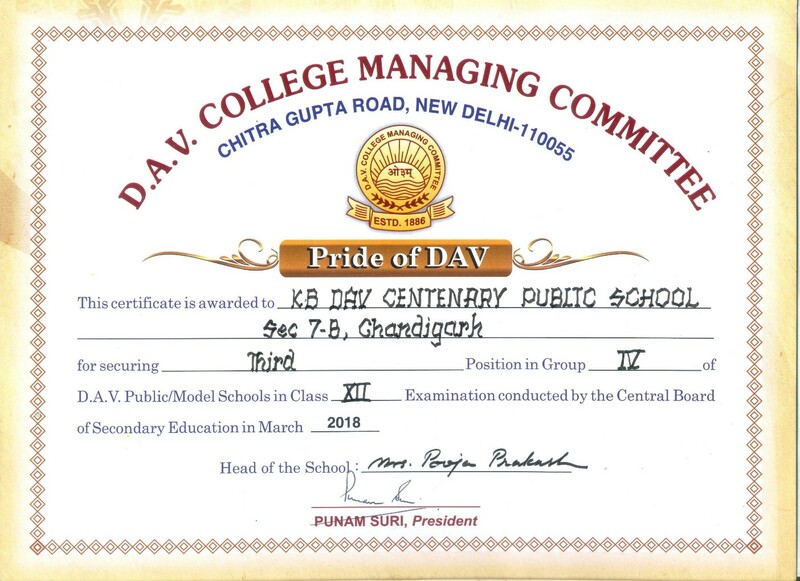 The school follows the curriculum framed by DAV Education Board, New Delhi. The School follows syllabus prescribed by CBSE, New Delhi. basis, chanting to Vedic Sholakas, which marks an auspicious beginning at school. The classroom assembly begins with the recitation of the Gayatri Mantra. a positive note. The day ends with the Shanti Path, recited by the whole school. The significant life skill of team work and coordination is inculcated in the students . Science, Art & Craft Exhibitions, Awareness Drives, celebrations of important National Days create interest in the learners, Besides this, the students learn to express their knowledge, exert their leadership and skills in real-time environment. Learning from real leaders, pioneers from different walks of life is finely attuned in the KBDAV-7 philosophy and curriculum. The learners have interacted with leaders and progressive thinkers like Hon'ble Union Minister (Railways), Shri. Pawan Kumar Bansal; Swami Sumedha Nand ji, Spiritual Head, Arya Samaj; Shri. Punam Suri, President, DAV College Managing Committee, New Delhi; Dr. R.S. Khandpur, Director General, Pushpa Gujral Science City, Kapurthala; Shri. Sunder Lal Bahuguna, noted Environmentalist; Smt. Tara Gandhi, Vice Chairman, Gandhi Samriti and Darshan Smiti, New Delhi and several other leading School Directors, DAV College Managing Committee, New Delhi and dignitaries. The learners at KBDAV-7 get the opportunity to visit a variety of locations, which is seen as an extension of classroom teaching. Field trips to Science City, War Memorial, Gardens and places of Worship help to imbibe a respect for culture and environment. Students learn the important skills of creative thinking while working independently. The children are encouraged to design file covers and create their activity files. The students plan and decorate school bulletin boards, placed outside all classrooms, for all important days and relevant social issues. Celebrations are made special, with the children from mainstream school donating generously and sharing sweets with the Saral Ahsaas learners, on the occasion of Pre-Diwali / Christmas. Flag Hoisting Ceremony is held in the school and the school resounds with strains of the National Anthem on the eve of Independence Day and Republic Day. Walking proud, with their heads held high, the frontrunners excelling in scholastic and co-scholastic receive medals, trophies and certificates. Extreme hard work and tireless planning gives way to resounding success. At primary level, the books are complemented with a set of CD's on sharing, caring, values and sense of responsibility. The technology enables the learners to expand their world beyond what is obvious. Plasma and LED touch boards facilitate teaching learning process. The technology driven learning provides students a 'one student-one computer' learning experience and Smart boards facilitate interactive learning. The children undertake fun-filled projects involving cutting, pasting, drawing and colouring to unfold their inherent artistic skills. The children develop cognitive, aesthetic, physical and mental skills by participating in co-scholastic activities like singing, dancing, dramatics, art and craft classes, physical training, various activities of school clubs like Eco Club, Red Ribbon Club, Cycle Club and NSS. Various events, competitions and activities are organized in the school by the House on duty, which takes the complete responsibility of making the function a grand success. The current term has seen the themes of Consumer Awareness and Rights, RTI, Relevance of Family Planning, Janamashtmi, Independence Day, Republic Day and Pre-Diwali Celebrations etc. Through our programmes of study we endeavour to promote lifelong learning as an essential and enduring quality to develop and refine the ever-changing skills needed for life in a complex and global community.